If you are planning a trip to Paris or just want to learn more about the City of Lights’ history, head to the very cool website called Paristique! Paristique is an interactive online map where each dot represents an urban element: a street, a square, a boulevard or a parvis (6,840 places in total). If you want to learn about the origin of a place’s name, all you have to do is click on it and a box explaining the origin and history of that place will open. Note: the site is exclusively in French! Guillaume Derolez, a Google engineer and creator of Paristique, carried out an impressive amount of research about Parisian streets on the no less impressive City of Paris’ Open Data website. The result is pretty impressive with its gorgeous watercolour map, colour-coded points of interest (white for streets, yellow for squares, pedestrian streets in blue). So if you have some time to check it out, do not hesitate! A good way to practise your reading skills in French! Top 15 Must-See and Must-Do Things in Paris!!! Ah, Paris, Paris, Paris!!! La vie en rose … Chabada bada … Such a beautiful city but so much to see! So where to start? Here are my top 15! 1) The Eiffel Tower or as my son used to call it The “Awful” Tower is a must-see! 2) Le Sacré-Coeur and Montmartre with its lovely intricate back streets and its painters. Not really authentic but fun and beautiful nonetheless! 4) L’Arc de Triomphe and its crazy mad roundabout: 12 main avenues radiate from this star after which the arc is named. 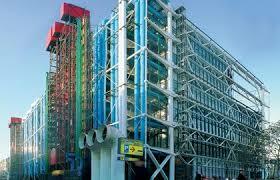 5) Le Centre Georges Pompidou, both a modern and contemporary art gallery and a cultural hub, its amazing structure attracts over 6 million visitors every year!! 6) Notre-Dame de Paris: one of the most popular attractions in Paris but so worth it!! 7) The Moulin Rouge or the Lido or the more intimate Crazy Horse! 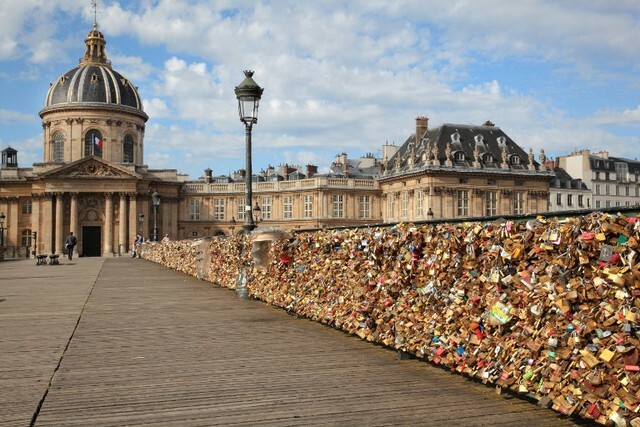 8) Ride a Bateau-Mouche on the Seine to see many of Paris’s beautiful bridges. You can even book a Bateau-Mouche including a meal, champagne and music! 9) The Musée d’Orsay located in a magnificent former old Beaux Arts railway station displaying the world’s largest collection of impressionist paintings. 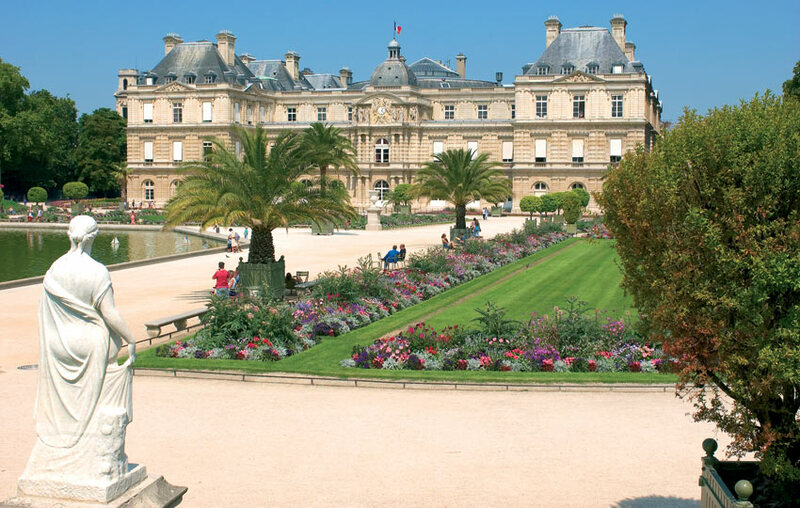 10) Enjoy Paris parks such as Le Jardin du Luxembourg near Saint-Germain-des-Prés and second largest park in Paris, where you can bask in a lounge chair while Parisian children play with their sailboats in the fountains: how quaint!! 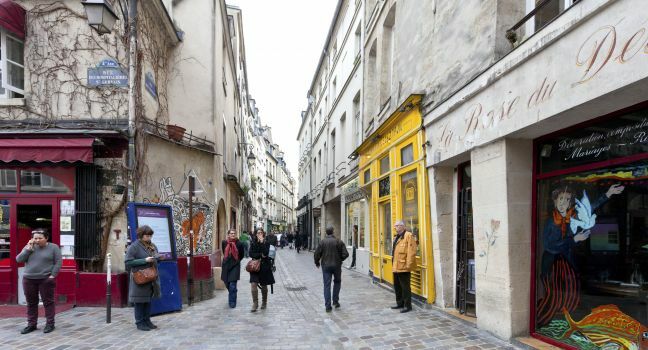 11) A stroll in Le Marais with its fabulous Hôtels Particuliers, quaint museums, great restaurants, cafés and Boutiques, located in the historic 3rd and 4th arrondissements. 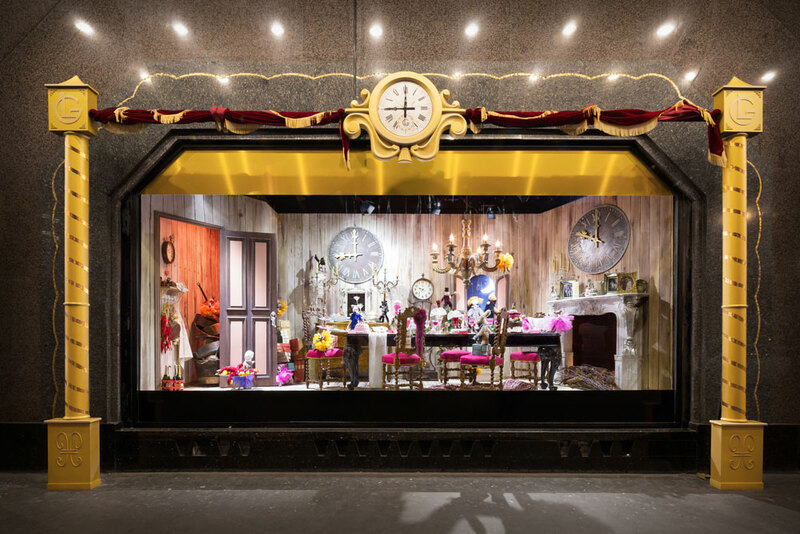 12) Shop on the Grands Boulevards and check the famous Galeries Lafayettes with its beautiful front windows decorations and AMAZING Christmas tree not to be missed! 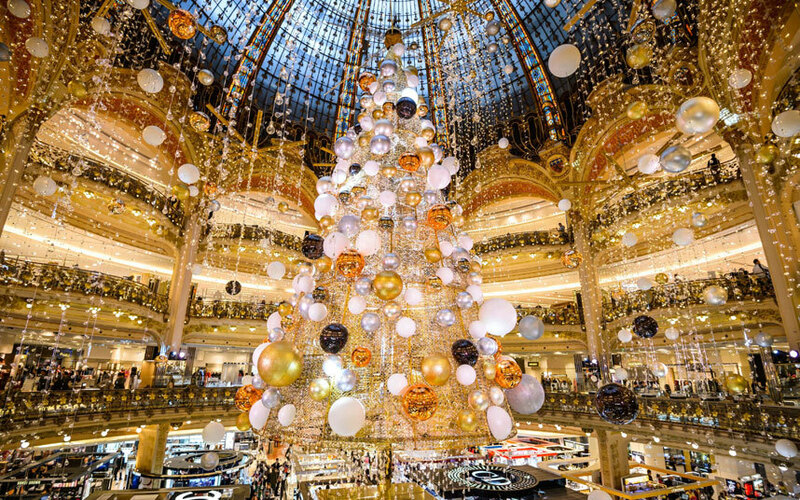 Galeries Lafayettes’ Amazing Christmas Tree! 13) Visit the hidden gem of the Jardin des Tuileries and my old time favorite, le musée de l’Orangerie, where you can discover two amazing collections: Claude Monet’s Water Lilies (The Nympheas) and the Walter-Guillaume collection (post-impressionist). 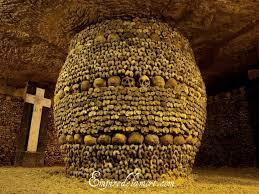 15) Les Catacombes: The spooky underground ossaries which are believed to hold the remains of over six million people! 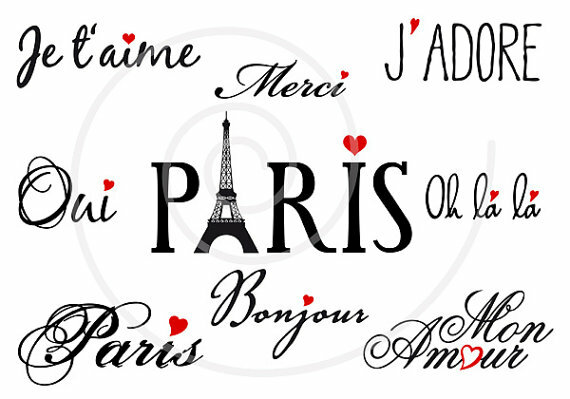 I hope that you enjoy your French trip and please please please, leave us some comments if you have visited any of those places!! Do you know Le Forum? Because if you don’t, well, then, you should! Le Forum is a bookshop which was established in Fremantle in 2004. 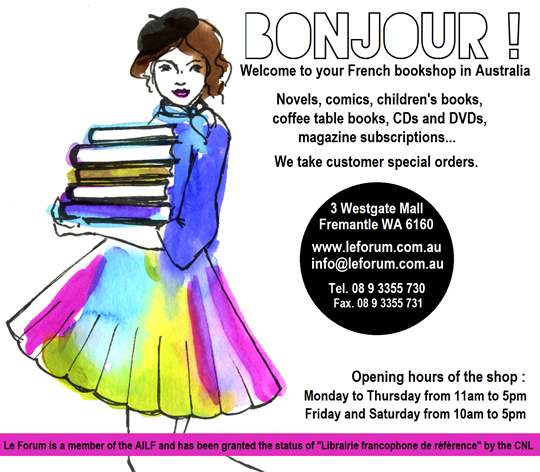 It is an independent bookstore dedicated to bring the best of French culture to Australia’s doorstep. 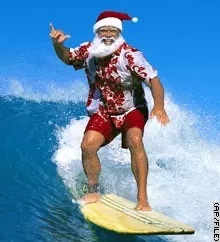 All of their products are also accessible via their online-selling shop and available to be shipped across Australia and New Zealand. If you are in the Perth Area, you can even visit their shop (address below)! DVDs: A selection of French movies subtitled or available in both languages. Events will be announced on the ‘home’ page of their website (see below). Another wonderful initiative is French Books on Wheels Inc (Le Van du Livre) which is a registered not-for-profit association in Australia. The project aims at meeting francophiles and francophones and familiarise them with French language publications through cultural exchanges all over Australia. With their partner ‘Le Forum’, a selection of books, magazines and DVDs is for sale in the van. 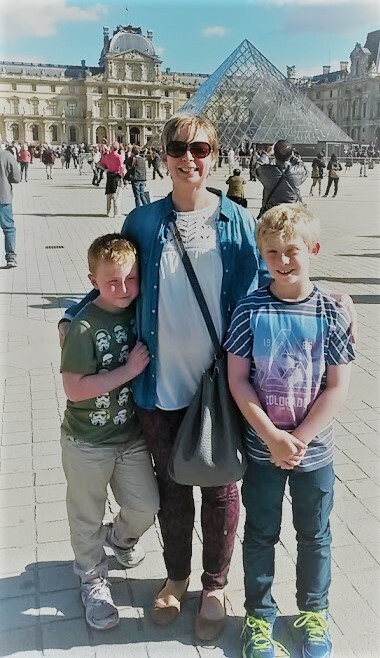 Working in the Van is Anne Mangeant, who has been living in Australia for 15 years and who represents Bayard and Milan Presse, the educational magazines for children and young adults. Also working in the Van is Jacques Bernard, who set up the first and only French bookshop Le Forum in Australia 10 years ago. He is very active in the Association Internationale des Libraires Francophones (AILF) which is based in Paris. I have had the pleasure to meet them both and must say that they are extremely nice and helpful! Definitely part of my “Amazing Frenchies in Australia” category! So do not waste any more time and go and browse their well-stocked website or shop! Parisian Timelapse to make you dream a little!!! A foreign language that you are learning should really be practised on a regular basis so as to maintain a good level of proficiency. So here are some tips as to what you can do to ensure that this level is maintained! I have also included some very useful links. 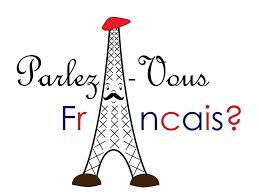 This is an easy and rather affordable way to practise your French on a regular basis! This is also the most convenient way to maintain your French since you can do this activity wherever you want! Make sure that you have a bilingual dictionary handy so that you can look new words up. You can buy books, borrow some from the local library, or download from the Internet where you can access all sorts of reading material: magazines, recipes, books, articles and much more! Watch movies, news or even adverts! You can rent foreign movies with subtitles, watch the French news or movies on SBS, or ads on youTube. Anything in French is good!